Decorative Window films have come a long way in the past decade and for offices and retail spaces here in Carrollton–that is a good thing. Happily, the days of dark tint and crude logos are gone and today’s decorative window films are more lovely than ever before. This is in large part to advances in printing graphics on films. As a matter of fact, some decorative films are even printed in HD! Even better, they come in a ton of great colors, designs, and textures to meet the needs of any office or retail space in Carrollton. With so many options to choose how do you figure out which one is right for you? Well, if you are looking for some inspiration or already have an idea of what you want to do, our ideas below are a great way to figure out or fill in your plan. Continue reading to find out some ultra-unique and stylish ways to use decorative window film in your Carrollton space. It is no secret glass surfaces on cubicles are pretty boring. The solution for bland cubicle design? Decorative window film! It is a great way to take plain glass on cubicles and turn it into something fun and attractive. You can also choose from any number of modern designs and bright colors making them a fun and a place employees love to spend their day. Conference rooms in offices have a reputation for being too open. To the point where, often times, people don’t like meeting in them because everyone who passes by looks at them during meetings. With Decorative window film on all or part of conference room windows, you get as little or as much privacy as you wan; plus a cool new art installment too. When your retail customers enjoy the ambiance of your store and the world you create for them– they buy more. Additionally, decorative window film is actually something that can be applied to any flat surface so, you can also use it as an attractive background on your walls or shelving. Use a pattern or texture that really compliments your products and you showcase your products in the best way possible. The front doors and windows of your store are what people see first– so this is a very important place for you to make an impression. Make it a good one with decorative window film– not just your store hours and phone number. Instead, think geometric patterns, playful or artsy decorations, and creative catchphrases are the new way to market your business. PLUS: decorative window film is so easy and cost-effective to remove, you can change up your storefront seasonally and really make it stand out from the crowd! 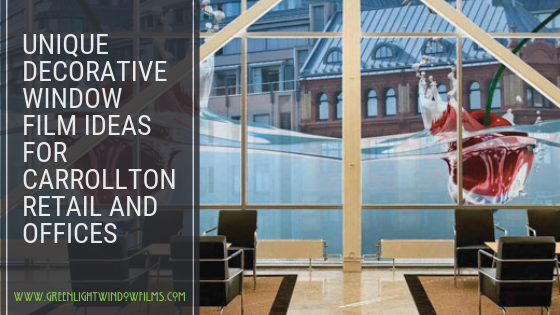 If you have a great idea of for decorative window film for your Carrollton office or retail location or need a few ideas to get you started, contact us at Greenlight Window Films. We serve all of the greater Dallas areas including Carrollton and we would love to work with you on your next window film project!